Amanda Gibby Peters says, with schedules loosening and the sun eager to linger in the spotlight, the opportunity to try shui is ripe. Because the best way to understand shui is to LIVE it. Around our house, the first few weeks of June are a mosh pit. We pounce upon the crumbling structure of the school routine, and we find ourselves intoxicated with freedom. But like any good thing, the energy gets sticky if we don’t set some organizing principles. Invite guests over and feed them. The shui at play here is if you are abundant enough to feed many mouths, you generate a prosperous vibe and like energy attracts more like energy. So, gather some good company and break bread together while the sunset pours into the sky. There is magic in our conversations and fellowship, and it hatches full-tilt happiness in our space. Learn more about Amanda Gibby Peters. Today, AYRIAL announced the Founder of Positive Power Strategies and Co-Founder of Power Vibes, Laura Novakowski. She’s an executive coach who also works with individuals to compel them to explore and expand their own power, potential and passion in order to reach extraordinary results. We’re proud to announce that AYRIAL’s newest Alexa Skill; AYRIAL Positive Living Daily Tips is now LIVE. A happy life is when individuals can easily receive positive living lifestyle tips to enhance their way of living – hands free, without picking up their mobile device or searching websites. 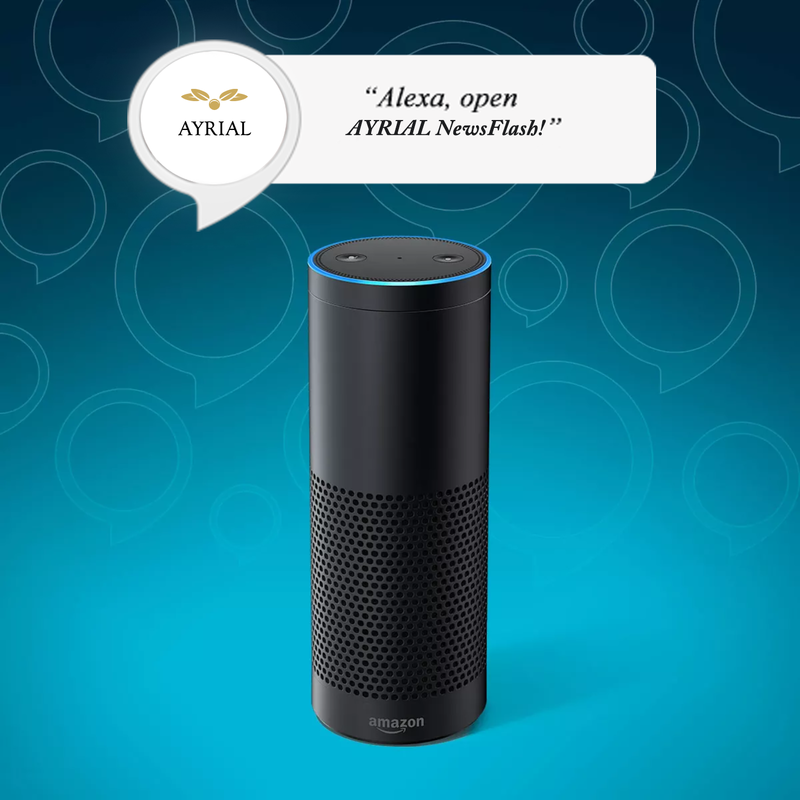 With AYRIAL’s new ‘Positive Living’ Alexa Skill, users can immediately receive daily lifestyle tips and to-dos with a simple voice command; “Alexa, open Positive Living” to their Amazon Echo device. After Alexa delivers a daily AYRIAL ‘Positive Living’ daily tip, users have the option to learn more about AYRIAL’s daily featured member, Alexa will send users a sms text with web-link straight to their mobile device. Users conveniently click on the web-link to read the featured member’s bio and easily “Click-to-Call” or email them to discover how they can enhance your way of living personally, professionally and spiritually. The best feng shui tips are provided by; Amanda Gibby Peters, Founder of Simple Shui; Laura Morris, Founder of Morris Feng Shui; Sybilla Lenz, Founder of Positive Living by Design and Viviana Estrada, Founder of Viviana Estrada Feng Shui & Chinese Astrology. There’s tips to attract romance, bring attention to your work, how to prepare your home to sell and how to enhance your personal relationships. Intuitive and Spiritual development tips from Guy Isabel. Business and personal relationship tips from Laurie Huston, Founder of Intuitive Soul. Understanding dreams by David Low, Ph.D. , and much more! You can enable this new Alexa Skill on Amazon or the Amazon app on your smartphone.